Each of the SHARE’s ceramic mugs were designed and made especially for True West Brewery taking inspiration from the classic German beer steins the Henry boys’ father brought back from his time in Europe while in the Army. 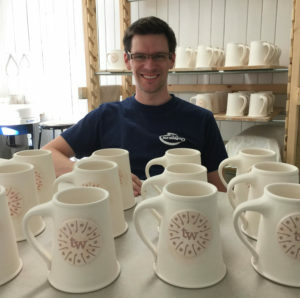 Our mugs were handcrafted in the beautiful White Mountains of western Maine by Joshua David Rysted. Joshua is a small batch potter who maintains a studio with his wife, Martha Grover, in Bethel, Maine. He focuses on creating finely crafted functional pottery for use in the home. Each mug holds 20-22 ounces and is made of durable white stoneware that features a silky satin matte exterior glaze that is kiln fired to over 2230º F. Joshua threw each mug individually by hand on the potter’s wheel and pulled each handle individually from a plug of clay attached to the side of the mug. Each mug is stamped with Joshua’s seal, a small “JD” at the bottom of the handle. No forms or molds were used in the shaping process, which means that each mug is unique. From Joshua’s hands to yours. Enjoy.